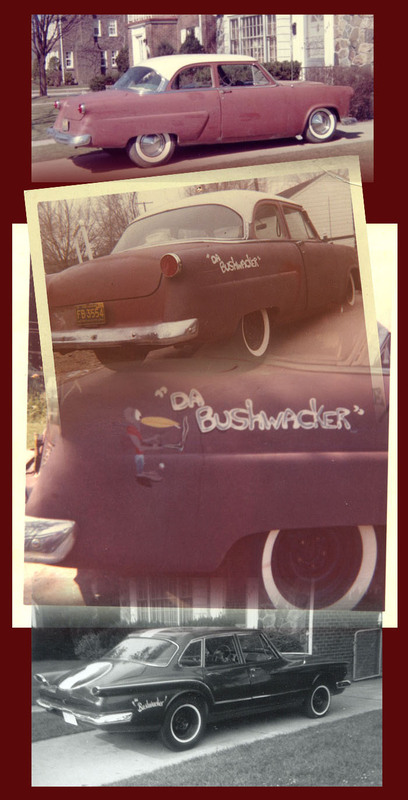 Daves '54 Ford (Bushwacker I) was bought from Art Stamburski in '59. It had a shaved nose and deck and was lowered in the front by heated coils. It ran on wide white fatties and had '57 Plymouth wheel covers. It was in primer when purchased it and was to stay that way. The motor was pretty much stock but was rebuilt and had a 'DragFast' inline floorshifter for the stock three-speed and exhaust cutouts just rear of the front wheelwells. Dave replaced the stock grill with a new '54 Chevy unit which was an almost perfect fit. Flat plastic taillight lenses finished the exterior (remember that cool trick!). The interior sported a pinstriped dashboard and new seatcovers with light blue carpeting. More information to follow on the cool Valiant (Bushwacker II).